At the farmer’s market, when I bought those chanterelles, I also spied a Kaboucha squash. It’s a pretty squash, as you can see from the picture; the kind of thing that you might use to decorate your kitchen in the fall. (And here in Los Angeles, where things aren’t so autumnal, I can use all the help I can get.) Only; if you just used the Kaboucha to decorate, you’d be missing out on its great flavor. 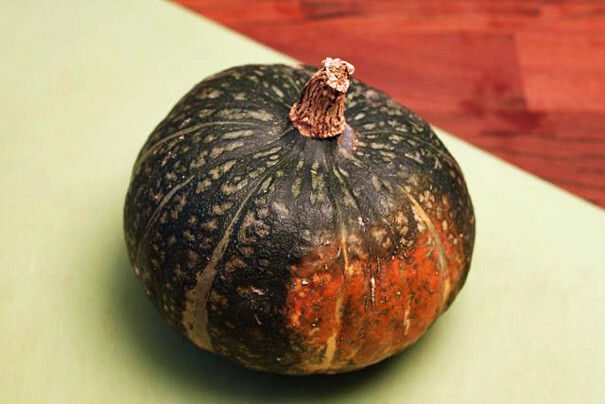 I remembered Kaboucha squash as one of the ingredients featured in “Sunday Suppers at Lucques,” which is why I initially bought it. But I didn’t have any of the other ingredients to make any of Suzanne Goin’s Kaboucha squash recipes, so instead I just improvised a recipe of my own. Looks kind of like cantaloupe, right? Only it doesn’t have listeria and it’s much harder to cut then a cantaloupe; use a super sharp knife and watch your fingers. 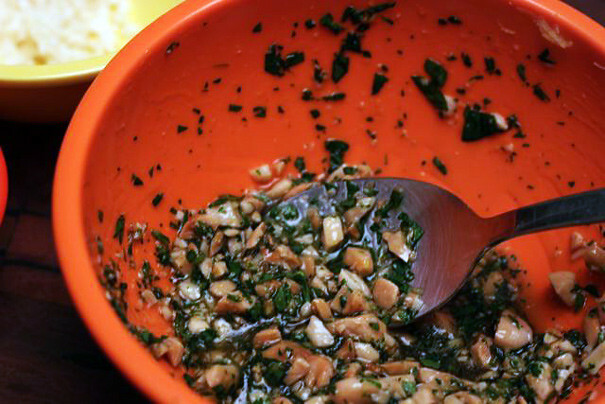 Sort of like a sweet and sour nutty gastrique. 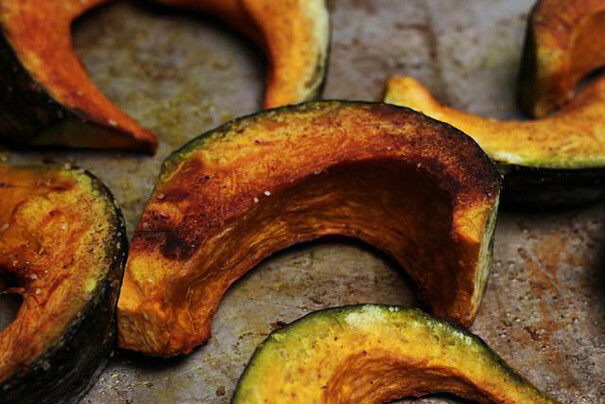 The cool part is you can eat the skin of the squash and everything. 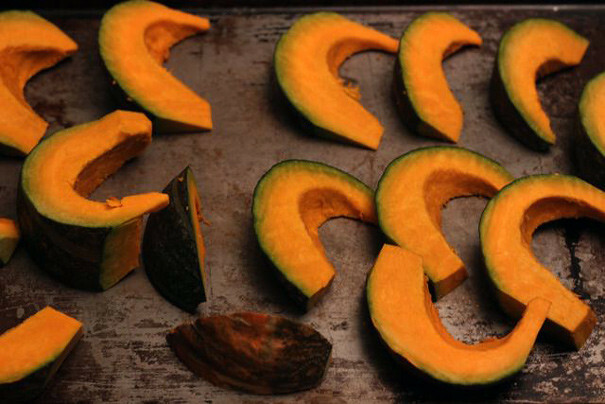 The taste is reminiscent of a butternut squash or an acorn squash, but sweeter and slightly more intense. The only thing I’ll say here, though, is that this squash was kind of mealy. Craig wasn’t a fan (though he loved my topping). I noticed in “Sunday Suppers” it says “if you see an orange Kaboucha, buy that” so maybe buying a green one means it’ll be mealier? Not sure. But I, for one, enjoyed it regardless of its mealiness. 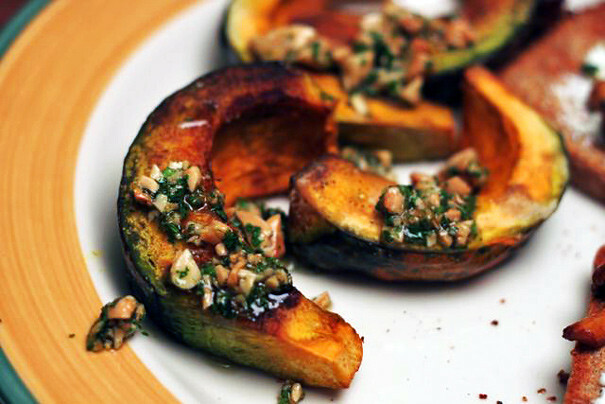 And that, my friends, is what you can do with a Kaboucha squash. What’s Up With These Black Chickpeas?